A fantastic turnout of New MINIs at the Ace this year. Not that you would know it as most were relegated to the neighboring car park. 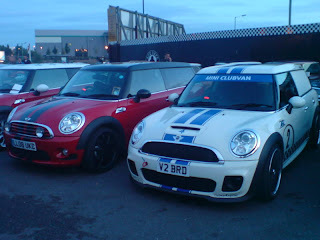 From 5 o'clock onwards new MINIs were being turned away even though, the car park at the Ace was more than half empty. 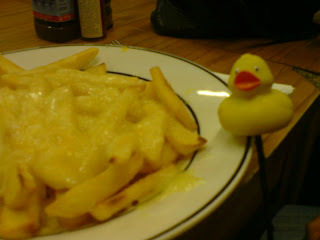 Gristy managed to get in but was ousted out. Whats more disappointing, is the quality of some of the classics, that they were letting in. Well we catagorically said we wasn't going to it this year, but in a mad moment we sucombed to the fun that's the Italian Job and put our names down to do it again. 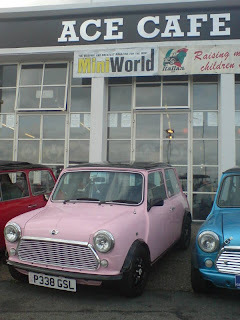 Tonights the annual charity auction at the Ace Cafe and all Minis New and Old are welcome. Spotted right in front row is Foxy Mini's 'Ruby' bag4ng a spot early on this very popular night.